Situated nine miles up the fabled Little Cottonwood Canyon lies the former mining enclave–turned–eclectic ski town of Alta, Utah. Alta captures the imagination of snow sliders from around the globe and attracts a wide array of individuals who call these mountains home. Inhabitants come from a variety of backgrounds, but they all share a common thread of love for the snowy environs and freedom of the hills. One such mountain lover is Mica Brownlie, a self-taught surfer from Oregon who landed in Little Cottonwood Canyon in 1999. His affinity for gliding across liquid water transferred nicely to the frozen variety, and he soon found himself returning to Alta year after year. Brownlie is in the midst of his 16th season up the canyon, and his focus has transitioned from slaying daily pow runs to engaging visitors and townspeople through a familiar medium: radio. What started out as an off-the-cuff idea is turning into a full-time job that requires a multitude of skill sets to maintain. 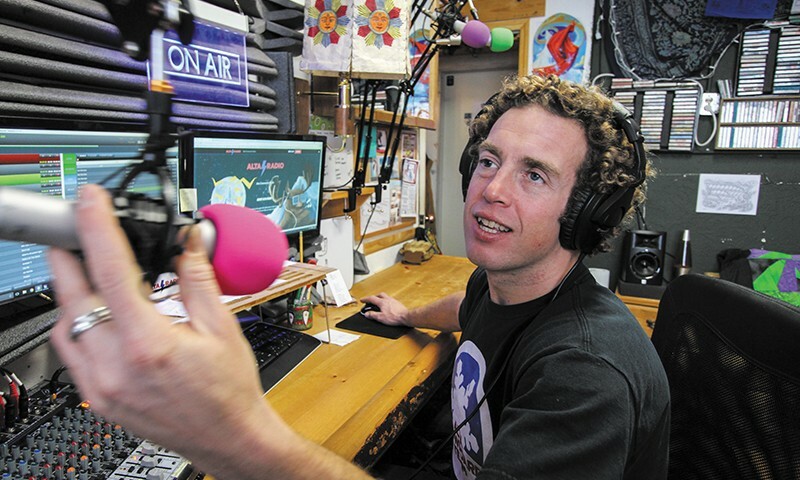 “We had the community—we needed the radio,” says Brownlie, aka “Captain.” After two seasons, his vision has come to life in the form of Alta Radio. Starting in the spring of 2013 with a series of grants from Alta Community Enrichment (ACE)—a nonprofit art, cultural and educational organization—Brownlie began researching the intricacies of terrestrial and Internet-based radio. Filling volumes of notebooks with his findings occupied his free time, and it finally became apparent that the enormous task of building a radio station from scratch could be possible. The laborious efforts of Brownlie, along with a cadre of friends and volunteers, culminated with the station’s first broadcast in Feb. 2014. Streaming live music and community content 24 hours a day during the season (December–April) takes dedication and unwavering patience. “It’s more fun than a regular job, but it is still work,” says Brownlie, whose main gig is serving quality cuisine and beverages to visitors at the famous Alta Peruvian Lodge. Beyond creating playlists and programming, the behind-the-scenes work of building the station’s computers and fixing technical equipment all falls on his shoulders. However, being a person about town is something he holds dear, so keeping the mountain culture alive and well isn’t just a hobby—it’s a lifestyle. Since its inception, Alta Radio has been a place where listeners can come to find a variety of musical genres and colorful commentary. Rock, reggae, funk, blues, soul and hip-hop dominate the station’s airwaves and are a throwback to the music Brownlie has enjoyed throughout his life. “It’s all my favorite music,” he says. “I grew up listening to a lot of this in the back of my mom’s car.” Inside the intimate quarters at “The Fort” (Peruvian employee housing) are the workings of the sole media outlet in Little Cottonwood Canyon. Varied collections of tapes and CDs grace the walls of the studio. 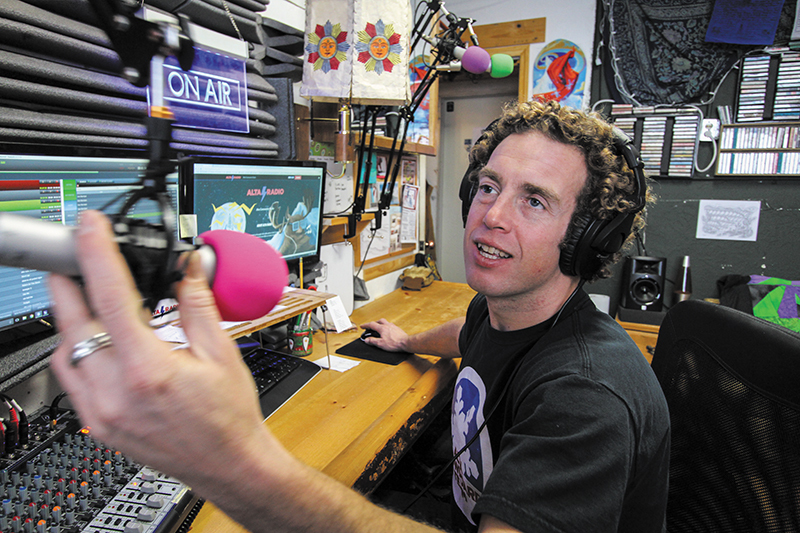 Two computers and a microphone serve as a digital launch pad for the voices of the mountain community. “I like the ability to look out the window and give real-time weather, trail conditions and traffic reports between sets,” says Brownlie. Part of the essence of Alta Radio is to continuously build connections with its followers. “We certainly serve a lot of locals, but what’s great about an Internet radio station is that people can take it home with them. We have listeners who tune in weeks in advance to get a handle on conditions before their annual ski trip,” says Brownlie. In addition to music and live reports, the station is developing other ways to interact with the community. SLC DJs often come up to showcase their talents on air and display a diverse selection of local flavor. Of course, there’s also the ever-present topic of who can and cannot slide at Alta, which provides endless material for the comedic duo of the “Captain and Blizzy Show,” which airs every other Thursday. Snowboarding is not allowed at Alta, and the dynamic banter between the two show hosts illustrates just how laughable this division can be. Brownlie is himself a snowboarder and founder of the Alta Snowboard Team. He has no strong opinions on Alta’s reluctant stance on the issue and admits that about a third of the town’s population rides a snowboard. “These people cook your food, serve you booze and plow your parking lots—even some of the patrollers snowboard off the clock,” says Brownlie. “I love the irony.” Until the day that Alta allows bipartisan snow sliding, he’ll continue happily shredding the Bird and dropping in through Alta’s gates on his way to work. Alta Radio is an inherently nimble platform and often goes remote to continue to reach a broader audience. On alternating Thursdays, they broadcast live from the Peruvian Bar to cover current topics, promote local events and make light of the terrible traffic (Red Snake) as it winds down canyon. Keeping a finger on the pulse of the town makes for compelling content and enables the station to maintain relevance. As the snow piles up each season, Brownlie will be dedicated to delivering a quality service that benefits the greater winter community. He also hopes to continue bringing in locals to take on some of the responsibilities and potentially make the station somewhat profitable through donations and regional advertising. Alta Radio—always your friend on a powder day. Tune in at altaradio.org, and be a part of the scene and make requests at facebook.com/altaradio.